James and Kat talk Star Wars Rebels, puzzle over riddles, and get real serious about an eggplant monster. James and Kat dig into Star Wars: The Force Awakens, and imagine a world where every weapon has been devoured by walking castles that poop magic animals. James and Kat discuss Splatoon, bicycles, magical fermentation, preserves, and Kobolds. That’s right. Someone was foolish enough to let James talk about Kobolds. 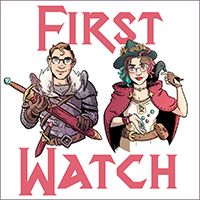 James and Kat discuss birthdays, weddings, emotional classification for games, and displacer beasts all be fore waking the fighter.